"A.D." chapter 2 coming this weekend! 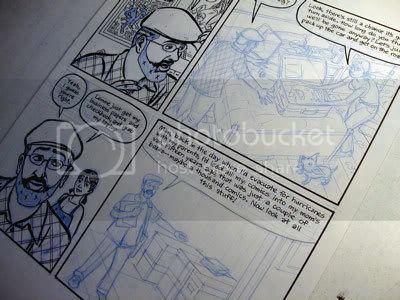 I’m finishing up the final page of chapter 2 of A.D., and it should get posted some time this weekend. Thanks to my new intern Sara, who’s been filling in blacks, erasing pages, scanning artwork, and doing color treatments, I’ve been able to speed up my process a bit (even given a week off for a quick spring trip to Puerto Rico). Yay, Sara! In chapter 2, our characters prepare for Katrina, deciding whether they should (or can) evacuate. Look for it on SMITH tomorrow or Sunday! It’s a sweet deal. I “share” Sara with Christine Norrie, and all I gotta do is buy Sara lunch each day (she’s here Wed-Fri) & sign her timesheets so she gets school credit for the internship. As I too am learning, interns are awesome. I can’t wait to see the finished pages! I’ve never drawn someone’s apartment in such detail as I have yours in the past month! Yes indeed! Besides all the grunt work she does, she also is a literal manifestation of my deadlines. Like I know if I don’t have a new page done for her to work on, she’ll have nothing to do. And thus I will be a failure. So just knowing she’s coming again the next day makes me push through on my deadlines when I might otherwise conk out. you’d think being someone who had to delegate work i’d remember things like that more often…. ← The Civilians' "Resurrection Vaudeville"